An automated mouse clicker, give you fingers a rest and let Aarons Auto Cliker do the work for you. It has an inbuilt time delay to allow you to position the cursor before it automatically takes over. The application will remember previous settings and screen locations from its last use so you do not have to keep setting it up. Now has adjustable mouse down time and minutes added, also left/right button selection. Record multiple clickpoints. An automated mouse clicker and typer, give your fingers a rest. ...... Now has adjustable mouse down time and minutes added, also left/right button selection. Record multiple clickpoints and save to a file for future use. 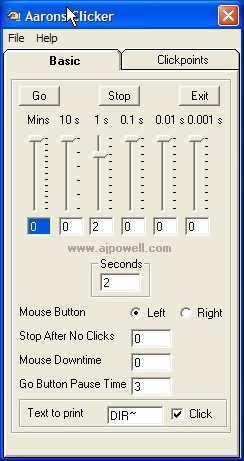 * A free auto mouse clicker to download, get your 30 day free trial. * A nice auto mouse clicker just set and leave it running. * It has an in built time delay to allow you to position the mouse before the clicker takes over. * Its a great little application where you need an auto mouse clicker. * Now with adjustable mouse down time and left/right mouse selection buttons as requested by some users. FTP client including file filters, common file save list, sorting, and more. Advanced MP3 Search is a simple tool for searching MP3 and WAV files online. Save a number of websites and Aarons Auto-Browse will loop through them all. Advanced MP3 Manager is an MP3 audio file manager and playlist organizer. Qweas is providing links to Aarons Advanced Auto Clicker/Typer 3.01 as a courtesy, and makes no representations regarding Aarons Advanced Auto Clicker/Typer or any other applications or any information related thereto. Any questions, complaints or claims regarding this application Aarons Advanced Auto Clicker/Typer 3.01 must be directed to the appropriate software vendor. You may click the publisher link of Aarons Advanced Auto Clicker/Typer on the top of this page to get more details about the vendor.